N.C. Cooperative Extension of Wayne County is currently recruiting potential vendors for the Farm Credit Farmers Market. 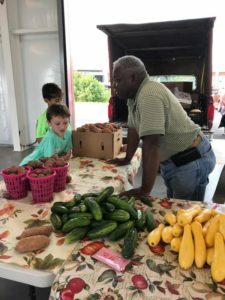 The market is located behind the Maxwell Regional Agricultural & Convention Center at 3114 Wayne Memorial Drive in Goldsboro. The market will open on April 11, 2019, and be open on Thursdays & Fridays from 10 a.m. to 5 p.m. and Saturdays from 9 a.m. to 2 p.m.
N.C. Cooperative Extension of Wayne County will be holding a Vendor Interest Meeting on Thursday, February 7 at 7 p.m. at the Farm Credit Farmers Market. (3114 Wayne Memorial Drive, Goldsboro). The meeting will include review of market rules, calendar of events, and an opportunity for potential vendors to ask questions. Please call 919-731-1520 to registe r for the meeting. Market rules will require that vendors grow and/or raise a minimum of 50% of sellable items. Sellable items include vegetables, fruits, eggs, meats, cut flowers, bedding plants & transplants, local honey, dairy products, low-risk preserved goods from locally grown products (jams, jellies, pickles), and firewood. Handcrafts will be accepted, however, priority for spaces will be for agriculture product vendors. Those interested in more information can obtain a copy of market rules and application at the N.C. Cooperative Extension of Wayne County office at 3114B Wayne Memorial Drive, Goldsboro or by calling at 919-731-1520. • Got Gardening Questions? Extension Master Gardener Volunteers Can Help!